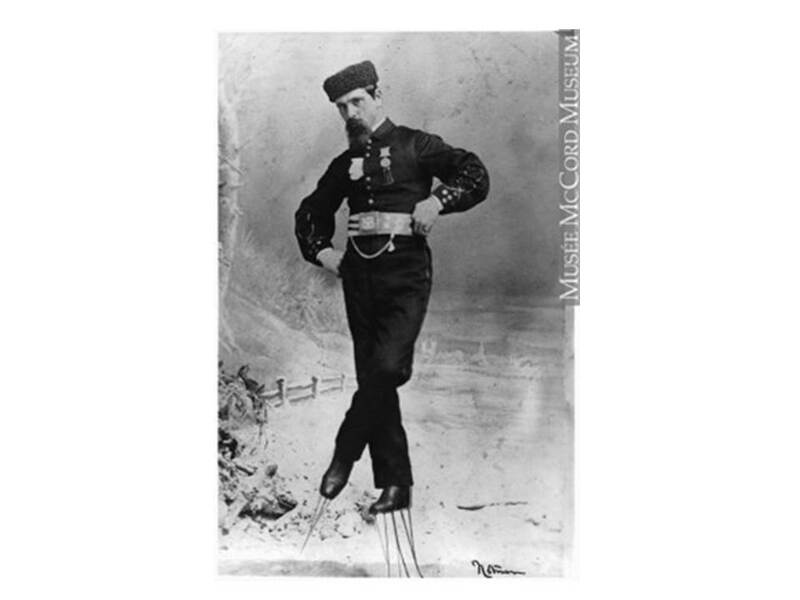 Captain John Miner had the talent to glide as effortlessly over the ice on his stilt skates as smoothly as his ships glided over Great Lakes waves. He forged a career on the Great Lakes for over fifty years, and commanded or owned more than 22 vessels for 42 of those years. He enjoyed a decades long ice and roller skating career that lasted well into his 70s. He won countless skating medals, performed for Queen Victoria, and patented several nautical and skating inventions. John Miner and his future wife Julie were French Canadian born. Both John and Julie Miner’s families came to Michigan from Canada, migrating to Detroit from along the shores of Lake Champlain in the Province of Quebec. Julie’s father, Charles Boucher, was a French waterman. The 1850 United States Federal Census shows Charles Boucher, age 71 born about 1779 in Canada, living in Monguagon, Wayne County Michigan. His family consisted of his wife Julie, 55, his son John 25, his son Charles, 16, and his daughter Julie, 22, along with Peter Rouby, age 14. Charles had been a member of the first John Jacob Astor’s expedition in 1810, traveling to the mouth of the Columbia River for the Northwestern Fur Company which vied with its rival Hudson’s Bay Company for monopoly of the fur trade. Jean Baptiste Menard Miner was born February 25, 1831, near Montreal, Quebec to Olivier and Angeline Menard Miner. Olivier brought his family to live in Detroit, Michigan in 1834. The 1850 United States Federal Census shows Oliver Miner, 47. who also Anglicized his name, living in Detroit with his wife Angeline, 45, and their children John, 19, Peter, 18, Angeline, 8, Adeline, 7, and Moses, 5. Other household members listed were William, Mary, John, Catharine, Maria, and Ann Hickey, and Catherine Durre, Flora Bird, Nelson Lafery, and George, Jane, and Alex Myers. In 1845, John Miner began his sailing career on the Great Lakes and by 1851 had become the captain of a sand scow. He briefly returned to Canada, living in Quebec in 1852-1853, but moved back to Michigan to continue building his career on the Great Lakes. When he married Julie Boucher on January 9, 1854 in Wayne County, Michigan, Captain John Miner signed his name as Jean Baptiste Menard on his Michigan marriage license. At some point after his marriage Jean Baptiste Menard Anglicized his name to John Miner, the name that he used while establishing his vessel and skating career and the one he passed on to his children along with a legacy of artistic and commercial talent. His wife Julie has the same variation in names. Although various records show her name as Julie and Julia, her name on the marriage record is Julie. Her full name was Marie Julia Boucher and some records show that she was born in July 1828, although the 1880 United States Federal Census shows that she and her husband John were the same age. Some sources say that the Miners had 11 children in fifteen years and others say they had seven children in fifteen years. Their son John was born in October 1854 and he died at the age of one year in October 1855. Their daughter Julia was born in October 1855 and lived until 1883. James and Jennie were born in 1861. Frank Joseph was born in 1862 and died in 1933. Ida G. was born in 1864 and died in 1934. John was born in 1869 and died in 1889. They also had unnamed triplets, and a son who was born in December 1870 and died on December 31, 1870. The 1880 United States Federal Census recorded Captain John Miner, 48, living in Detroit with his wife Julia, 48, and their children Julia, 25, Jennie, 19, Ida, 16, Frank, 18, and John, 11. He identified his occupation as tug captain. The 1900 United States Federal Census documents Julia as the mother of 11 children, with three living. The Miners had been married for 49 years when Marie Julia Boucher Miner died on December 13, 1903. She is buried in Mt. Elliot Cemetery in Detroit. After the Sloop Sweeper, Captain Miner built, owned, and commanded the Michigan Flower, Storm, Whittlesey, J.B. Chapin, Schooner Kate Hinchman, bark John Miner, and the schooner Julia Miner. The Buffalo Morning Express of March 11, 1861, reported that the scow Michigan Flower, built in 1852, collided with the Bark B.S. Sheppard on the St. Clair Flats. Captain William Vessy tells the story of one of Captain Miner’s voyages on the Storm in a book called Kelly’s Island, the Courageous, Poignant, and often Quirkly Lives of Island Pioneers, 1810-1861, by Leslie Korenko. According to Captain Vessy, the mariner who told the story, on December 22, 1853, he spotted a schooner that seemed to be in trouble a few miles off shore from West Sister Island in Lake Erie. After a perilous trip over the ice, he reached the schooner which he discovered to be the Storm, and found it deserted. He later discovered that Captain John Miner, the champion ice skater of the United States and a Detroit citizen, was the Captain of the Storm. The wind sifted, the vessel drifted, and Captain Miner and his crew decided to try to reach shore. After deciding that the Storm would founder and leaving their clothing aboard, Captain Miner and his crew trekked over the ice to West Sister Island. They reached shore safely and returned to their respective homes. Over the next ten days, Captain Vessy and a crew managed to repair the Storm enough to have it appraised at a salvage value of $6,000. Captain Vessy said that two days later Captain John Miner came down, looking downcast. Captain Miner knew that a demand from Captain Vessy would cause him to lose 2/3 of all he owned as salvage and was ruled by the risk of life and danger of total loss of the property. Captain Miner played upon Captain Vessy’s sympathy skillfully enough to have Captain Vessy agree to accept the meager sum of $300.00 for ten days of lonely and dangerous work. In 1860, Captain Miner owned the J.B. Chapin, built in 1858 at Swan Creek, Michigan. The schooner went through several owners before it wrecked on November 8, 1877 in Lake Michigan off of Chicago. The schooner Kate Hinchman sunk in Ogden’s Canal at Chicago, remained out of commission for two seasons, and was raised and fitted out in April of 1877. The schooner John Miner was built at Detroit, Michigan in 1866, and made her home port at Chicago, Illinois. She was lost during a storm on Lake Huron on October 19, 1902. Driven into shallows filled with boulders, she quickly broke apart, but luckily the Lifesaving Service rescued the crew. The Julia Miner, built in 1867 by Dupont & Perra in Detroit, is not listed in the History of the Great Lakes biography of Captain John Miner as one of his vessels, but since it is named for his wife Julia Miner, it is likely that he either had an interest in or owned the wooden schooner. The Julia Miner struck a reef and wrecked in Lake Huron northeast of Big Charity Island in Saginaw Bay on June 7, 1894. Captain Miner’s other vessels included the tug William Goodnow, the propellers Victory and Star, and the Brig Concord. The tug William Goodnow, built in Milwaukee in 1866 by Allen & McClellan, sank in Lake Huron off Lexington, Michigan, on June 14, 1869. While waiting for a tow in the dark, the Goodnow was rammed by the bark Sunnyside and sank in 13 fathoms of water in about 15 minutes. The Sunnyside managed to save the Goodnow’s crew. The Goodnow was salvaged and rebuilt in 1879, but had vanished from the ship registry by 1894. A two-masted, square-rigged sailing ship, the brig Concord was involved in a collision with the propeller driven sailing ship General Taylor during a heavy fog off Whitefish Point in Lake Superior on November 2, 1858. The Taylor’s owner Sheldon McKnight filed a suit against the Concord in Detroit District Court which escalated into the murder of the Concord’s captain, Henry L. Jones, and an international diplomatic incident with Canada. In November 1869, the Concord sank in a Lake Erie storm. Captain Miner also owned or was master of the tug Magnet, the steam propeller Benton, the steamer Mary Mills, the schooner George Worthington, the steamer Henry Howard, the schooner Morton, the steamer Empire, the schooner John S. Richards, and the propeller Skater. Built by S. Kirby & Hoyt of Saginaw, Michigan in 1856, the sidewheel tug Magnet originally operated as a log rafting tug. In 1863, the Magnet was rebuilt and converted to a wrecking tug at Buffalo and during her life as a wrecking tug she carried the first line mortar on the Great Lakes. In 1879, the Magnet was converted to a sloop barge, and in 1888 J.W. Westcott converted her to a schooner. On September 12, 1900, the Magnet was bound for Marine City and she foundered in a Lake Erie storm one mile northeast of Middle Sister Island. Ironically, the steamer Frank E. Kirby, designed and name after the son of the Magnet’s builder Frank E. Kirby, rescued the Magnet’s crew. Hitchcock & Gibson built the propeller Benton in 1867 in Buffalo, New York as a passenger steamer. The Detroit Free Press of May 28, 1870, reported that showman Dan Costello had booked the propeller Benton for a forty day cruise. She boarded the troupe at Racine, Wisconsin, visiting different places on the east and west shores of Lake Michigan and then sailed to Green Bay and then to Lake Superior. After the Benton completed the voyage she engaged in the fruit trade between Chicago and St. Joseph, Michigan. The Benton Harbor and St. Joseph Navigation Company owned the Benton and Captain John Morrison commanded her. On August 1, 1909, the Benton burned at the Ford Rouge plant on the Rouge River near Detroit while crewmen unloaded unfinished wooden automobile parts. The Mary Mills was built in Vicksburg (Marysville) , Michigan by P. Lester in 1872. On December 11, 1900, she burned in the harbor at Sturgeon Bay, Wisconsin. A story in the Sturgeon Bay Advocate of June 15, 1901 noted that The steambarge Rand, Capt. John Bolton, stopped in port briefly Wednesday evening while bound south with lumber cargo. She is taking the place of the burned steamer Mary Mills, which still lies where she sank in this bay. In 1853, W. Treat built the wooden schooner-barge George Worthington in Euclid Creek, Ohio, and eventually Detroit became the George Worthington’s home port. The Marine Record noted that on September 10, 1884, the George Worthington was damaged by a collision on the St. Clair River. She had a fatal nighttime collision with the ore-carrying schooner George W. Davis on June 22, 1887, near Colchester Shoal in Lake Erie. In a story dated July 23, 1887, the Detroit News reported that the schooner George Worthington of Detroit was sunk the night before after a collision with the schooner George W. Davis of Huron off Colchester Reef, Lake Erie. The Worthington was light while the Davis carried a load of iron ore. The crew of the Worthington took to their boats and got aboard the Davis and all were saved. The Worthington had a bad hole stove in her and went down. Captain Rice of the steam barge Mackinac of Detroit owned the Worthington. She had a tonnage of 220, and was built in 1852. Fitzgerald & Stewart of Port Huron built the steamer Henry Howard in 1867, and in 1884 she was owned by J. Miner, the wife of John Miner, and B. Noose. On September 10, 1884, the Henry Howard was bound for St. Ignace with the barge George Worthington in tow. She caught fire while in transit, beached on Harsen’s Island at the mouth of the St. Clair River, beached on the island and burned herself out. The Port Huron Daily Times of Thursday, September 11, 1884, reported the burning of the steam barge Henry Howard which was upward bound on Lake Huron to the St. Clair River towing the schooner Worthington. She was scorched by running against the steam barge and when the fire was discovered, the captain ran her aground. She burned about one mile below Algonac on the St. Clair River at 10 p.m. on Wednesday night and was reported to be a total loss. The fire broke out near the engine room and the flames spread rapidly. B. Noose and Julia Miner owned the Henry Howard which was built at Port Huron in 1867 and was 261 tons burden. Valued in Lloyd’s Register at $5,000, insurance $3,000. In 1848, A.C. Keating of Monroe, Michigan built the schooner Julius D. Morton or J.D. Morton as a sidewheel passenger steamer, later to become a tug. The Buffalo Morning Express of Wednesday, September 17, 1851, reported that the J.D. Morton while off Point Au Pelee coming down Lake Erie encountered a sea which carried away her gangway, some freight, and one of her deck hands overboard. The deckhand’s name was Bryant and he had recently come to the United States from Ireland. On August 13, 1873, the J.D. Morton in the tow of the propeller Sun with five other vessels and carrying 250,000 feet of lumber, was bound from Saginaw for Erie, Pennsylvania. She caught fire near Algonac and burned to the waterline. The captain, his wife and their small daughter and a sailor escaped in the yawl. Two other sailors decided to stay aboard the Morton and later drowned. Officials believed that the fire had been set by an arsonist and the Morton was eventually raised and rebuilt to a barge. The wooden steamer Empire was built in Cleveland, Ohio in 1844. George W. Jones was the master carpenter and the original owners were D.N. Barney et al. On April 20, 1847, the Empire carried its largest load of flour at 4,028 barrels and 180 barrels of mixed freight. The Detroit Free Press of Monday, June 14, 1847, reported that the clerk of the steamer Oregon spied the steamer Empire, bound down, aground on the St. Clair Flats. In December 1851, severe winter weather forced the Empire to throw off 600 live hogs and 300 dead hogs. On August 2, 1862, the Empire was rebuilt at Clarks Dry Dock in Detroit as a barge featuring one deck, one mast, and measuring 251x33’6” for the lumber trade. On July 15, 1867, Thomas and John McGregor and D.G Mcalpine of Detroit owned the Empire. The Buffalo Morning Express of April 20, 1870, reported that the old barge Empire, formerly a first class lake steamer, has been rebuilt and furnished with a propeller engine. She is owned by T.J. McGregor of Detroit. On November 16, 1870, the Empire left Saginaw bound for Buffalo towing the canal boat F.P. Sears and the barge Glad Tidings. She stranded during a Lake Erie Storm, split lengthwise and pounded to pieces off Long Point near Port Rowan, Ontario. The John S. Richards, built in Cleveland in 1869, was a three masted wooden schooner. On August 1, 1900, the J.S. Richards carrying a load of pig iron was navigating the Detroit River when the steamer John W. Moore collided with her and sank her. Two crewmen sleeping in the forecastle were crushed as they slept. The Richards was later recovered, but abandoned in 1911. Stories in the Detroit Free Press and the Saginaw Courier-Herald added details to the sinking of the J.S. Richards. The Saginaw Courier-Herald of August 2, 1900 reported that on August 1, 1900 at 1:35 o'clock the schooner J.S. Richards was run into and almost instantly sunk by the steel steamer John W .Moore about 500 feet from off the Walkerville dock, and two sailors asleep in the forecastle were sent down to death with their boat. The Richards and the Lake Forest were being towed down the lakes to southern ports on Lake Erie by the tug Cressel, in charge of Capt. Harndon. The Richards was in the middle with a long tow line connecting her with the tug and the Forest. Upbound, close under the Canadian shore, was the steamer Moore, loaded with coal. So wide a space separated the boats that no whistles were blown. By continuing on her course the Moore would pass several hundred feet to the east of the tow. Instead of so doing, something went wrong on the upbound boat, according to the statements of the men on the tow and the Moore sheered far to port and headed straight for the tow. The tug Cressell passed her in safety, but the Richards, coming up under the swift lead of the tug and the force of the current, was struck a crushing blow by the big steamer on the port bow just at the timber heads. There was no time for an examination of the injury. The Moore backed away and almost immediately the Richards lurched over on her injured side, trembled a second as a wrecked mast crashed down to the deck, and then shot downward beneath the black waters of the deep channel. No man had time to grab his belongings. All but two of the six sailors on the schooner rushed for the rigging and clambered up the mast that was still standing. The dead : John Ives, sailor, Sandusky 32 years old, wife and two children. John Kelly, sailor, Rochester, N. Y., 40 years old, single. The Cressell, turning about, rescued the imperiled crew, and landed the captain, Anthony T. May; the mate, A. Eason; cook Catharine Davis and seaman Peter Janson at the foot of Woodward Avenue about 3 o'clock this morning. The J.S. Richards is one of the old time canal boats. She is of 259 tons burden, 138 feet long, and was built in 1869. Capt. Anthony T. May has owned her for 12 years and valued her at $6,000. This winter he laid her up at the foot of Ropeller Street and rebuilt her at a cost of $1,000. No insurance was carried on the boat, and she represents almost the total of Capt. May's fortune. The Moore is owned in Cleveland. She is built of steel, is rated at 1,689 tons, and is 246 feet long. She was built at Toledo in 1890, and is engaged in the ore and coal carrying trade. As a result of the collision last night she sustained minor damages and reported that she was leaking. Soon after the accident, after all need of assistance was past, she headed up stream, her pumps being sufficient to keep down the water. The Detroit Free Press of August 12, 1900, reported that Underwriters have hired H.W. Baker, of this city, to raise the pig iron out of the hull of the schooner J. S. Richards, sunk off Walkerville, and after completing the job he will also undertake to patch the hull and raise it with pontoons. Unless the hull is entirely demolished forward it ought to come up easily, as it is small and light. Side wheelers and fast propellers, in fact all boats that create heavy seas, will be asked to slow down when passing the wreck. Let a few more craft go to the bottom between Lake Erie and Lake Huron and it will be difficult for anything to make schedule time with the frequent slow-downs. The steel steamer John W. Moore, which sank the Richards, is in dry dock at West Superior. In spite of the reticence of her master, crew and owners, the details of her damage are gradually leaking out, and they show she is badly cracked up about the bow. The fall of one of the schooner's masts nearly demolished the Moore's after cabin and other parts of her upper works, including a spar; the stem is worthless, and parts of both bows will need re-rolled and entirely new plates. She will be in dock six days or longer. The Saginaw Courier-Herald of September 30, 1900 noted that Captain Horace Baker, who has been removing the wreck of the schooner J.S. Richards from the Canadian channel, near Detroit, succeeded in getting the hulk entirely out of the way Thursday. The wreck has been pulled onto the shoals at the foot of Belle Isle and the channel is now clear. The Dominion government officials have accordingly surrendered the cargo of pig iron which was taken off the Richards, and it is being loaded on the schooner Monguagon and will be taken to Buffalo. It is expected that a search of the hull will result in finding the body of one of the two seamen who were drowned when the Richards sank. The Detroit Free Press in a story dated October 8, 1900, said that Walter Oades, after having made a survey of the wreck of the schooner J.S. Richards on the middle-ground below Belle Island bridge, Detroit River, reported the hull is damaged beyond repair. Thomas Thurston built the Skater as a wooden screw propeller in 1890 at Detroit, Michigan, with Captain John Miner of Detroit the original owner. In June 1893, the Skater burned twenty miles north of Manistee, Michigan and was named a total loss. Louis Pahlow rebuilt the Skater in June 1894 in Manistee, Michigan for owner T. Richardson of Milwaukee, Wisconsin. The Skater was abandoned and her machinery removed in Michigan City, Indiana, in 1941. Beeson’s Marine Directory of the Northwestern Lakes of 1906 summarized the ship designing, building, and skippering segment of Captain John Miner’s career by reporting that between 1865-1870 he was partially owned and sailed 13 different vessels, before he retired as captain and owner of the excursion steamer Skater. The Beeson’s biography also noted Captain Miner as one of the champion skaters of the world, demonstrating his skill in American and Canadian cities and internationally. The biography concluded that in 1906 at the age of 76 Captain Miner still was hale and hearty and still skating. Captain John Miner created a true namesake when he christened his wooden screw propeller the Skater, for he ice skated and roller skated at a championship level on both high and low skates from the 1870s into his senior years in the early twentieth century. Every winter for decades he skated on frozen ponds and rivers in and around Detroit, perfecting his artistry and speed. He celebrated his 70th birthday on February 25, 1901, by giving afternoon and evening skating exhibitions on the Wayne Pavilion Rink skating on high and low skates. He managed the rink and demonstrated his skill often, at the persistent requests of his friends and admirers. In 1871, Captain Miner skated his way across Canada and Michigan, defeating all of his competitors in both speed and artistic skating. On March 1, 1871, he performed at the Victoria Rink in Montreal at an entertainment given by Prince Arthur, a brother of the reigning King Edward. Perhaps as an inspiration and a reminder, Captain Miner wore the championship belt of Michigan that he had won in a contest in Jackson. He retained the belt as an undefeated champion. His other trophies included a silver cup for speed skating, a medal for being the Detroit’s best skater, and several others that he had won during his travels. A Detroit Historical Society article said that Captain Miner enjoyed the honor of performing solo in front of Queen Victoria. Canadians and their newspapers also noted Captain Miner’s skating skill and speed, the London, Ontario, papers highly praising his exhibition of fancy skating and identifying him as a well-known tug master. Captain Miner told the Amherstburg Echo that he was 53 years old, the father of 11 children, and the grandfather of quite a number. He said that three of his children were triplets, but they had not survived very long after birth. developed other patented vessel improvements. He transferred his creative energy to skating as well. He made his own skates, including the twelve inch high steel stilt skates that he used to perform intricate movements two feet off of the ice. In 1897 he submitted a patent for a skate runner designed to greatly increase speed. Captain John Miner died on July 10, 1909 and he is buried in Mount Elliot Cemetery in Detroit. Captain Miner died in 1909, but his contributions to skating grew like Lake Erie ice floes. According to legend, the Iroquois in Canada skated by tying animal shinbones to their feet with leather thongs and French explorers skated as early as 1604 in Acadia. British garrison officers introduced skating as a sport in Canada in the 1840s and it quickly became popular. Skating was deemed appropriate for girls and women and it became an important social recreation. In 1850, the first planned outdoor commercial rink opened in Montreal, and the first covered rink in the world was built in Quebec City in 1852. Soon Canada became first in the world in developing early skating rinks. Builders used natural ice in these early rinks and also constructed large sheds to protect skaters from the wind and snow. Built in 1862, the Victoria skating Rink in Montreal became the most famous of the early rinks and established the standard rink size for the game of ice hockey. Captain Miner believed in both roller and ice skating rinks and managed the Wayne Rink. Skates evolved along with skating rinks. Iron skates were introduced in the 17th century and by the 1850s steel skates fastened to the skater’s shoes with screws and clamps appeared. In 1861, Nova Scotian John Forbes developed the first spring skate that eliminated screws and plates. Eventually, skates with a blade permanently attached to the boot were introduced. By creating and perfecting his own speed skates, Captain Miner contributed to developing the modern ice skate. John and Julia Miner are listed on the membership registry of St. Anne’s Catholic Church in Detroit and they both came from a French Canadian Catholic heritage. Part of the heritage included racing ponies over the ice and skating over the ice. They embraced the French Canadian idea that skating was an acceptable and healthy sport. The Christian Advocate' said that skating rinks have led to a great increase of extravagance; many of them have side-shows attached; there are opportunities for indiscretions, the first steps towards vice. There is no parental supervision; legitimate business of various kinds is interfered with, and the craze is a direct antagonist of religious effort. Gustave Flaubert is credited with the saying Le bon Diu est dans le detail!! The good God is in the detail. Like most ideas and inventions, humanity and the human condition have transformed and transmuted the original. The devil is in the details is a version of Flaubert’s quote just as Captain Miner’s life is an example of his passion and attention to the details of shipping and skating and the snug harbor of his family. Clarence Burton, The City of Detroit, Michigan 1701-1922, Volume 3, p. 743. An account of the Astoria Expedition confirms that there were several French Canadian River or Watermen connected to the Astoria Expedition. Frank J. Miner a son of Captain John and Julia boucher Miner. He was a contracting electrical engineer born in Detroit on March 28, 1862. The family came to Detroit from Lake Champlain. Frank’s maternal grandfather, Julia’s father, was Charles Boucher. Charles was a member of the expedition sent out by the first John Jacob Astor to the mouth of the Columbia River in the interests of the Northwestern Fur Company which was a rival of the Hudson’s Bay Company. The Boucher family is French. “Michigan Deaths, 1867-1897.” Database with images. Family Search, httP:// Family Search. Org Secretary of State, Department of Vital Records, Lansing. There is also a record for Virginia (Jennie) Miner. Virginia Barker, Virginia Miner. Gender: Female. Marital Status: Widowed. Birth Date: Dec, 1861. Birth Place: Detroit, Wayne County, Michigan. Death Date, October 4, 1936. Death Place: Detroit, Wayne, Michigan. Death Age: 74. File Number: 215965. Father: John Miner. Mother: Julia Boucher. From the collection of C. Patrick Labadie in the Alpena County George N. Fletcher Public Library Northeast Michigan Oral History and Historic Photograph Archive. Buffalo Commercial Advertiser, November 1846. The Fredonia Censor of Monday says that the WHITTLESEY, Capt. A.C. Boggs, while making Dunkirk at 10:00 on Friday last, was driven by a sudden shift of wind upon a ledge of rocks, between the beacon and dummy. She had made inside with wind from the N. E. and was proceeding to change sail when she was struck by a sudden flaw from the eastward, which drove her upon the ledge, where she safely remained, with the loss of rudder only, until Saturday afternoon, when she was got off with the assistance of the stm. INDIAN QUEEN, after some 10 or 15 tons of her cargo had been thrown overboard. The WHITTLESEY was owned by Messrs. W.W. Brigham and Capt. Dwight, of Dunkirk, and is insured in this city. The Censor also learns that a sloop of Conneaut, and from Buffalo, was beached at Dunkirk, the same night, after following the WHITTLESEY. She was without cargo. On Sunday morning the schooner KATE HINCHMAN sunk in Ogden's Canal at Chicago. She had been out of commission for two seasons. She is to be raised and fitted out. Schooner KATE HINCHMAN. U. S. No. 14036. Of 236.42 tons. Home port, Chicago, Ill. Merchant Vessel List, U.S., 1895. Schooner JOHN MINER. U. S. No. 12686. Of 273.32 tons gross; 259.6 tons net. Built at Detroit, Mich., in 1866. Home port, Chicago, Ill. 134.4 x 26.0 x 10.4; Great Lakes Shipwreck File, John Miner; Detroit Free Press, August 23, 1900-Schooner Captain Flourished a Revolver to Make His Crew Work; Cleveland Morning Leader, Friday December 8, 1854. Detroit Free Press, August 11, 1878. American Vs. Canadian Tugs. Capt. Hart's new propeller VICTORY was launched yesterday from the shipyard of Messrs. Sanford & Moses, in fine style. She sits admirably in the water, and will rank number one in the popular class of steamboats. The new prop. PRINCETON, built at Perrysburgh, was launched on Saturday last -- Cleveland Herald. National Daily Pilot - March 17, 1845. The Great Lakes Shipwreck File: Total Losses of Great Lakes Ships 1679-1999. By Dave Swayze. Benton. The Great Lakes Shipwreck File: Total Losses of Great Lakes Ships 1679-1999. By Dave Swayze. Mary Mills. Sturgeon Bay Advocate, June 15, 1901. Lake Wreck Report for 1884; Marine Record, December 25, 1884. The Great Lakes Shipwreck File: Total Losses of Great Lakes Ships 1679-1999, by Dave Swayze. George Worthington. Detroit News, July 23, 1887. The Great Lakes Shipwreck File: Total Losses of Great Lakes Ships 1679-1999. By Dave Swayze. Propeller Henry Howard. Port Huron Daily Times, Thursday, September 11, 1884; Marine Review, October 2, 1884. The owners of the steambarge HENRY HOWARD, recently burned on St. Clair river, are being sued for $1,200 for the non-delivery of a cargo, according to contract. She was insured for $9,000 and valued at $12,000. The Detroit Tribune, Thursday, July 29, 1886. Preparations are being carried out for the launching of the steamer EIGHTH OHIO, from the foot of Adair Street, this city. Her boilers and machinery are in place, and the hull comparatively finished. She will be propelled by the engine formerly in the steam barge HENRY HOWARD. The Buffalo Morning Express, Wednesday, September 17, 1851. The Great Lakes Shipwreck File: Total Losses of Great Lakes Ships 1679-1999. By Dave Swayze. J.D. Morton. The Detroit Free Press, Monday, June 14, 1847; Buffalo Morning Express, April 20, 1870. The Great Lakes Shipwreck File: Total Losses of Great Lakes Ships 1679-1999. By Dave Swayze. John S. Richards. Beeson’s Marine Directory of the Northwestern Lakes. Harvey Childs Beeson., 1906. Captain John Miner. portrait McCord Museum Montreal and family tree. Excerpts from the Amherstburg Echo, 1884-1885. As an illustration of Captain Miner’s shipping interests, The Amherstburg Echo of July 24, 1885 also noted that Captain John L. Miner of Detroit was in town Wednesday seeing what returns he would likely receive from putting an excursion boat on between Windsor and Detroit and Bois Blanc Island and Amherstburg. It is thought the steamer Hiawatha is the one he has in view. J ulian T. Fitzgerald, History on Ice and Roller Skating, 1916. Julian T. Fitzgerald, History on Ice and Roller Skating, 1916. History of the Great Lakes, Volume 2. U.S. French Catholic Church Records (Drouin Collection) 1695-1954.